The average graduate who took out loans (and 7 out of 10 do) and graduated in 2012 borrowed $29,400 for a bachelor’s degree. That’s a monthly payment of $312 on a standard, 10-year repayment plan. For an associate degree, it’s $17,158, or a monthly payment of $182. The majority of students — more than 70 percent of all bachelor’s degree recipients — now borrow money to pay for college, a higher proportion than ever. Those students owe $29,400 on average at graduation. 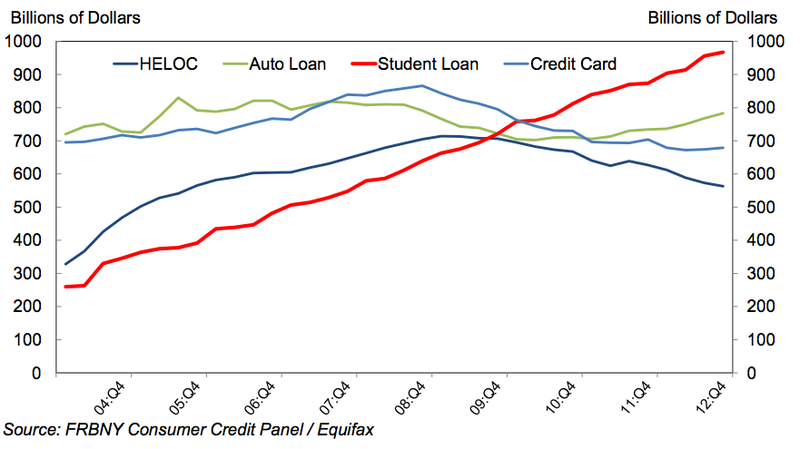 Student debt drew public attention and concern as the recession hit and graduates fell behind on their loans. There’s now a growing consensus among economists that student debt is a drag on the economy, too, because indebted graduates and dropouts have less money to spend on other things. 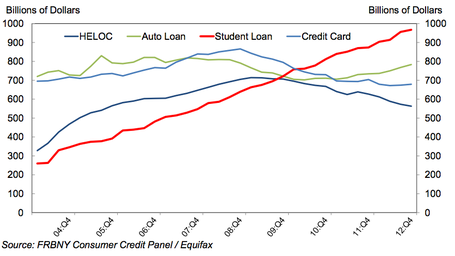 But actual debt from paying for college is probably higher. Some students or parents use credit cards, loans from retirement plans, or home equity lines of credit to pay tuition, fees, and living expenses. Those financial products aren’t included in the $1.2 trillion estimate.